echnology production line was established in Richmond, BC, Canada, along with overseas partnerships to provide fast and efficient mass production capabilities for Foreseeson EMS customers. 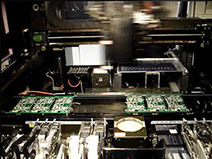 Local SMT manufacturing facilities enable EMS customers to receive leading-edge technology products on a flexible and timely basis, while overseas manufacturing facilities let us offer volume pricing. We have the capabilities to provide small-, medium- and high-volume production services for customers who are looking for cost-down solutions when volumes increase. e are a total solutions provider for customers who demand excellence and flexibility in the contract manufacture of electronic products. Production efficiency is enhanced by utilizing high-speed and accurate overseas manufacturing equipment. We keep orders on schedule so customers' production schedules and storage requirements are met. We offer competitive prices based on customers' product specifications and production needs. We make continuous improvements through staff training, system and process analyses, internal and external audits, and customer feedback studies. We genuinely believe in building long-term strategic partnerships with our customers for mutual benefit, success, and growth.